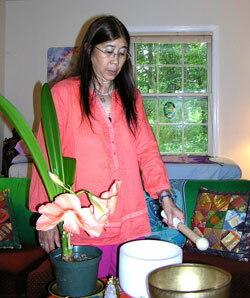 Karuna Joy is a practitioner and teacher of Self Healing Arts. She has locations in Northern Virginia for private and distant healing sessions using healing modalities such as Reiki Treatments, Sound Therapy, Yoga of Sound, Crystal Bowl Healings, Energy Healing, Singing and Voice Therapy Lessons, and much more. Reston Reiki and Self Healing Arts is based in Reston Virginia, with other locations available within Fairfax County including Herndon, Great Falls, Burke, Centerville, Vienna and Oakton. Karuna Joy draws clients from all over Greater Washington DC, including Tyson's Corner, McLean, Alexandria, Arlington, Falls Church, Annandale, Bethesda, Silver Spring Maryland and all over the USA. She has many long distance client sessions using powerful energy healings techniques from all over USA and abroad. She offers holistic healing sessions, counseling and instruction, spanning a variety of healing modalities, which embrace the spirit/mind/body connection supporting the each individual’s momentum to heal on all levels. Karuna uses a wide variety of holistic healing modalities while working with her clients. She loves working with her clients and trusting that whatever energies (modalities) are meant to come through will grace them in a magically magnificent way, opening the door for an amazing healing. Karuna’s deepest wish is to support her clients in their journey of self healing, helping to clear the way for them to be all that they can be, in the highest and best way, with grace and ease. Karuna is a devoted teacher of young children; she home schooled her five children. She is a very talented musician and creates beautiful healing music. Her music group, Somos el Mar, presents music programs in the community for the elderly and those in healthcare facilities. 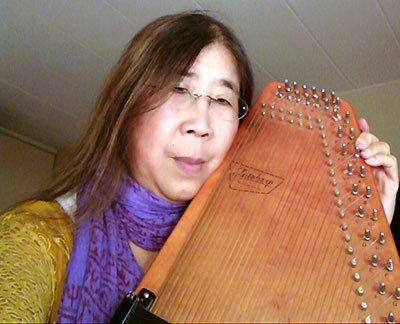 In addition to music, she is deeply committed to learning, practicing, teaching other healing arts and sound healing. Finally, she is always amazed by the wonder of her own endless journey of self discovery! Karuna's clients come to her seeking balance, peace, and harmony in their lives on all levels - physical, mental, emotional, and spiritual. Distant Healing is just a phone call away and available using Skype. Distant Energy Healing, Theta Healing, Reiki Healings can be done in person or during a phone session. She is grateful to have so many energy healing resources to draw from years of training and practice. The ones that are perfect for each client's situation and temperament always come through powerfully, yet gracefully. Transformational processing can take up as much of the session, as is needed, as the client opens to healing energies in sharing, releasing, and coming to balance and integration. It is an inspiring process. Sound healing, using vibrational tools (such as Tibetan and crystal singing bowls, tuning forks, drums, voice, tinkshas, and rattles), is often woven into the fabric of the session. This results in a profound connection with universal healing energy. Sound healing can quickly take one to a deep meditative and expansive state. It can facilitate a welcome release from negative energy, allowing love and light, that is our natural condition, to come flooding into our being. It is a sacred, joyous journey of transformation. Quality of sound is infinitely better than Facebook... deep gratitude and love, karuna joy. Know the sweetness of the indwelling divine heart, breathing this in with each breath, letting it wash completely through you. Chant graced by the Angelic Harp. So much gratitude for sharing sacred song with the universe, for the peace, wellbeing, liberation of all beings. Karuna Joy Large Crystal Singing Bowl Om Shri Amma. Supreme blessings of love, light, and peace, to all from the Divine Mother. Laughter Yoga is a purifying, joyous, unifying meditative practice, that brings, healing, balance, and support on all levels of our being. all remind us strongly of our true essence, fundamental connection with Universal, Divine Light, and Love. Yoga Nidra is an ancient, self healing process which deeply purifies the energy body. is an ancient Hawaiian spiritual healing that might be experienced as a "spiritual eraser". Saying the four phrases, "Please forgive me. I'm sorry. I love you. I thank you", aloud or silently, is a spiritual practice. It is profound, deeply cleansing, and supports bringing us into the life changing space of neutrality and connectedness with all beings. Do You Remember Who You Really Are? One of Karuna's deepest wishes, beyond facilitating deep releases, integration, and balance, is to empower her clients with their own ability to heal themselves. 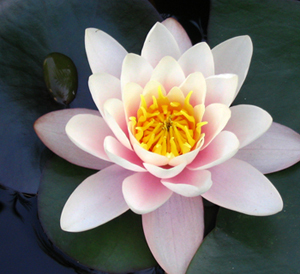 She offers them many self-healing tools, such as: Emotional Freedom Technique, clearing visualizations and meditations, Tapas Acupressure Technique, self-hypnosis, flower essences, sound healing, and self-acupressure. A session typically ends with ample opportunity to experience relaxing and harmonizing energy healing time on the table. Clients return home leaving refreshed, renewed, relaxed, energized, optimistic, at peace, and with a higher level of physical well-being. They are confident that they can use their newly acquired self-healing tools to support this balanced and harmonious state. Phone and long distance (remote) sessions are also available and a real blessing. Here are some of the possible energy resources that may be enjoyed during Karuna's healing sessions, as well as a listing of some of her class offerings. Karuna integrates many styles of Reiki Energy Healings into her sessions, including White Dove, Lightarian, Mariel, Sacred Flame, Violet Flame, Karuna, Shamballa MdH, and Seichim/Sekhem. Karuna also calls upon various modalities such as Integrated Energy Therapy, Theta Healing, Emotional Freedom Technique (EFT), Reconnective Healing, Shamballa MdH, All Love (skhm), Flower Essences, Color and Sound Healing, Meditation, Hypnotherapy, Yuen Full Spectrum Wellness Revolutionary Energy Work and Self Acupressure. In addition to the above mentioned, Karuna can advise and provide instruction in Color Therapy, Self-Acupressure, Thoughtfield Therapy, Introductory Breathwork, and other easily accessible self healing arts. If you feel guided to follow the path of Spiritual Healing or Energy Healing, and need guidance, skills, tools, inner clarity and self confidence to move forward, Karuna is committed to offering you the support, knowledge, and inspiration to follow your dream to joyous realization. Healing skills, inner clarity and awareness, an open heart, and energetic strength and alignment, are just as important as having a strong internet presence, giving healing demos and classes, and a viable office space, etc. All of these and more inspire the full manifestation of a successful and gratifying healing practice. It is with gratitude, and my deepest honor to gently walk walk my students through the door that leads their soul to their heart's desire of becoming a spiritual healer. What an inspirational and phenomenal transformation to witness as well as experience! Those who come as clients to receive sessions, and receive Karuna Joy's teachings, as well as those who consistently attend workshops, long and short, and demonstrate proficiency, and understanding of the basic principles of Self Healing Arts, will be awarded a Certification in the Self Healing Arts, in recognition of their time spent, knowledge, and direct experience of the spirit, and application of the principles and specific techniques associated with this body of work. It is both a joy and honor to share this journey of inner light, with my amazing clients and students, towards an ever deepening understanding of what it means to truly come to wholeness in body, mind, and spirit. And that, most significantly, we have always been radiant and whole. We have merely forgotten, and the self healing journey is none other than a remembering, a reawakening of this dazzling truth, and an allowing of this simple awareness to re-anchor strongly within us, and radiate out to the universe, for the benefit of all beings. Transformational and Success Mentoring will provide you with inspiration, guidance, feedback and suggestions to assist you in optimizing the quality of your work experience, and all aspects of your life. Within the context of these individual mentoring sessions, any number of clearing perspectives might be accessed to identify and release any obstacles, such as self sabotaging beliefs and fears that are holding you back from being all that you can be. After that we invite in and strengthen the qualities you need for coming to optimal wellbeing and wholeness. This opens the way for your moving to the next exciting phase of your life's transformational unfolding. I support and inspire your momentum towards infinite fulfillment and success in all areas of your life and work. You will rise to an increased level of self empowerment and self confidence. You will be ready to launch yourself with renewed clarity and passion on the next phase of your journey towards realizing your highest potential. You will find yourself increasingly successful and fulfilled in every aspect of your life and work. It's time to awaken the true you! I am eternally grateful and honored for this opportunity to open the way for my clients' experiencing such success and exciting transformation! Much of the joy in my session work, comes from holding sacred space for my clients to arrive at their own expanded perspective of their current challenging situation, as being a pivotal step in their soul's learning process. They are supported in their souful investigation of their options for taking the next step in their life's path. Once these are no longer in place to sabotage one's deepest healing/wholing intentions, and fulfilling of their life's purpose/soul's mission,---- one is finally free to move forward in life with clarity, peace, grace, love, and joy. Halleluia! It is truly a joy and honor to witness this wondrous unfolding of the latest transition on their spiritual healing journey, as they once more move deeper into alignment with their soul's mission, and the light of who they truly are. Energetic Well Being Process is a highly accessible energy healing process that directly clears the root causes of our symptoms on all levels. These root causes are cleared and completely released, eliminating the symptoms in the process. This process teaches us how to live our lives with peace and joy, without the familiar drama and reaction. EWBP is a highly effective energy healing perspective that has its roots in principles of traditional Chinese Energy Healing. We learn how easy it is to return again and again to our natural state of wellness, freedom, vitality, kindness, joy, love, and clarity. Energetic Well Being Process strongly supports ourselves, loved ones, friends and clients, on our collective healing journey. Clients and students gracefully release pain, negativity, dis-ease, symptoms of aging, low self esteem, and depression. They learn how to love and accept themselves, rise to their full potential, in a space of optimism, constant rejuvenation, and vitality. They become stronger, and fitter in all ways, and once more return to their natural state of love, abundance, joy, harmony, and boundless energy. People's lives shift dramatically in wonderful, amazing ways, inviting in limitless possibilities, and expansion in all aspects of their lives. Reiki is the Japanese word for “universal life force energy.” More and more people are discovering the benefits of Reiki and it is now the fastest growing alternative therapy in the world. Reiki healing sessions relax the body and mind, harmonize the emotions, and accelerate the healing process on all levels (physical, emotional, mental, and spiritual). The medical community is increasingly providing Reiki treatments to assist with anxiety and promote faster healing. Reiki has been found to reduce fatigue and calm patients by lowering their blood pressure and heart rates. In a Reiki healing session, Karuna uses a gentle touch or places her hands slightly above the body allowing this healing energy to be received by the client. The client is comfortably clothed and the technique is non-invasive. To enjoy the benefits of Reiki, all the client needs to do is close her/his eyes and relax, as the therapist sends the energy. If you are looking for Reiki in Northern Virginia, Fairfax VA and other areas of Washington DC call or email us today. Shows your employees you care and wish to improve their work experience! These powerful sessions clear and enhance all levels of one’s 12-strand DNA to support physical, mental, emotional, and spiritual healing to bring greater alignment with one’s divine soul mission on earth. Theta Healing accesses the Theta wavelength (high frequency brain wave) that connects with the Creative Energy, which moves all things. Beliefs and feelings linked to sickness can instantly shift. Belief and feeling work empower people with the ability to remove and replace negative emotions, feelings and thoughts with positive beneficial ones. Theta Healing is an amazing high vibrational experience that connects us to the highest level of Love and Energy of All That Is. Heartlight Angelic Healing Sessions result in a deepening awareness of the light of Spirit that shines within-- the Heartlight, and opens the connection to the Divine Heart. This opening and awareness inspires a spiritual awakening, and alignment with our soul's path. It is by easily identifying, clearing, and releasing blocked areas, or negative energy disruptions, in our energy field, that Heartlight Sessions invite in this awareness of our radiant inner light, deepening our connection to the Divine heart. This is facilitated by applying energy and sound, allowing a deep level of healing, as "baggage"is released that no longer serves us. A Heartlight Practitioner locates areas of discordant energy, and dissolves them in Divine Golden Light, expanding our Heartlight, and deepening our spiritual heart connection. A simple example might be chronic back pain that is rooted in the mental/emotional body. The practitioner simply locates the the area or areas of discordant energy, and then dissolves them in the Divine Golden Light, relieving the pain almost instantly. Heartlight Angelic Healing focuses primarily on our lightbody layers, where causal factors are held. It is a powerful synergy of energetic and spiritual healing, guided by angels and supported by their loving healing light. All healing sessions occur within the sacred space of the Heartlight Temple of Angelic Healing, an etheric retreat where Angels and Masters convene to assist with all forms of healing using the energies of Divine Love. Their sacred mission is to support a greater awareness of the light of Spirit that radiates within us, the Heartlight, opening our connection to the Divine Heart. Reconnective Healing, founded by Dr. Eric Pearl, is an amazing healing technique that powerfully integrates and heals multi-dimensionally using reconnective frequencies. Reconnective Healing is a form of healing that is here on the planet for the very first time. It reconnects us to the fullness of the universe as it reconnects us to the fullness of our beings and of who we are. It connects us to the universe and to our very essence not just through a new set of healing frequencies, but possibly through an entirely new bandwidth. Healing sessions using Reconnective energy and science laboratories have verified very clearly the reality of its existence. It is through new levels of light and information that we are able to reconnect to the universe and the depths of who we really are. For more information, visit www.ReconnectNow.net. The Reconnection is about connecting our personal energy grid system (acupuncture lines and subtle anatomy, including chakras) with the energy grid system of the greater universe. Once connected with the greater energy grid, we receive an influx of light and information that completely transforms our body-mind-spirit. The Reconnection restores us to spiritual wholeness. It releases blocks that have kept us separate from our inner perfection. Our DNA is restructured, and we are reconnected to the universe on a whole new level. Have you ever wanted to feel reconnected -- to feel whole, to feel all that you can be, to feel free to move forward on the next step of your life's journey? Then you need to experience a Reconnection, an amazing life changing process where you once more reconnect to the fullness of yourself, and the fullness of the universe! You are never the same afterwards!. For more information, visit www.ReconnectNow.net. Light Realignment Healing is a comprehensive, full spectrum energy healing. Its breadth includes the frequencies of all healing perspectives, and as such, is highly effective. Light Realignment Healing is a non intentional, receptive, healing experience, where we are open to receive whatever energies we need to come to balance and deep peace. We come to balance on all levels, physical, mental, emotional, and spiritual. Old limiting self defeating mental thought patterns magically break up, and fly off, as does the accompanying emotional residue, that literally heavily weighs us down, and leads to physical distress, if not released. Relief of stress and distress on all levels, is our welcome outcome, including specific pain relief, support of serious conditions, such as cancer, stroke, addiction, and eating disorder recovery. Complete relaxation, a feeling of the relief of letting go of everything that is not in our highest good, and deep peace, are enticing invitations for clients to return again and again. In truth, this profoundly balancing experience is merely reminding us of our core alignment with our spiritual light. Our challenges, our life lessons, have the potential of temporarily shifting us out of our intrinsic spiritual alignment. Light Realignment Healing, literally, offers us the precious gift of once more realigning with our inner light. People leave their session, refreshed, revitalized, relieved, radiantly glowing, with a sense of freedom, and deep peace. A Light Realignment Healing experience may include the frequencies of sacred sound vibrations, crystal therapy, color healing, aromatherapy, guided meditation, intuitive light touch, as well as energy work in the aura. You lie, relaxed, fully clothed, nestled in blankets, totally immersed in the healing frequencies, on the healing table. This healing journey takes you into a place of deep peace, as whatever it is in your highest good to release at this time, is gracefully let go of. You may feel the healing vibrations actively addressing problematic areas, experience distressing emotions lift off of you, see amazing colors and visions, connect with spiritual beings, journey to deeper dimensions, and/or enter a realm of such peace and light, that nothing can be recalled, yet peace, clarity, and a lightening of the spirit prevail. Certification is available as a practitioner of Light Realignment Healing. Light Realignment is also referred to as an axiatonal alignment in some circles. It is highly recommended that this process be experienced during times of transition, as it strongly supports a graceful release, and stepping into the entirely new perspective, our change demands of us. This process, where you receive a significant spiritual energetic activation, restores you to your perfect, divine, energetic template. Recall the presence of an infant or young child, so full of grace, and the wonder of presence. This is the state the Light Realignment invites us to revisit. As the young child grows up, she begins to invite into her energy field those lessons she came here in this life to learn. And it is those very challenges that, ironically, seem to pull us off balance and out of alignment with our light, even though ultimately, we are moving into profound spiritual alignment, and fulfillment of our heart's desire. After a Light Realignment, we once again begin to flow with our life, able to fully embrace an expanded, loving perspective. Your spiritual evolution is greatly accelerated, with a Light Realignment, and you finally realign with the integrity, clarity, and relief of finally knowing and actualizing your soul's purpose. Your session experience is merely the beginning of your Light Realignment Journey, as it takes about ten months for this process to completely unfold, and integrate into your being, and life situation. During this time, you will be attracting new and wonderful things into your life, as your vibration increases, and you anchor more thoroughly into alignment with your spiritual light, the truth of who you are. You breathe, and live each moment, increasingly grounded in your new expanded, love and light filled presence. During your light realignment, you lie fully clothed on the healing table, as I trace lines and points, activating energetic lines, points, meridians, and chakra points above your body, that realign you with your spiritual light, and universal light, as these energy lines also extend out into the universe, realigning you with universal energy grid lines. Your journey may be gracefully supported by the frequencies of sacred sound vibrations, crystal therapy, color healing, aromatherapy, guided meditation, and intuitive light touch. People have a variety of experiences during this profound journey of realignment with their spiritual light. They may release old physical pain, that has no medical explanation, and distressful emotions, see beautiful inspiring visions and colors, connect with spiritual guides, journey to past lives to clear ongoing issues, or go into a profound state of peace, so deeply that nothing but pure, never before experienced peace, can be recalled. These are just a small taste of the possible Light Realignment experiences. Basically whatever is in our highest good is what we will receive during this life changing spiritual healing journey. One crosses the threshold into a whole new expanded, loving, integrated way of being, where we find our life's journey dramatically altered, as we once again align with our deepest soul's purpose and the light of who we truly are. In order for your energy field to openly and gracefully receive the Light Realignment, it is strongly suggested that you experience 1-3 Light Realignment Healing Sessions beforehand. Certification is available as a facilitator of the Light Realignment. Karuna is also a practitioner of Reconnective Healing and the Reconnection. After about eight years of experience facilitating Reconnective Healing and Reconnections, she is moving on to this more inclusive healing vision, of Light Realignment Healing and the Light Realignment, where an unlimited, healing palette, with a rainbow of healing resource possibilities await one. She has found this open ended healing perspective much more effective and resonant with her free spirited, creative, and innovative style, than Reconnective Healing allows. A significant portion of her healing work has been largely inspired by Reconnective Healing and the Reconnection, so she is eternally grateful to Eric Pearl and his staff for sharing this teaching. All Love (Skhm) is a unique system of Energy Healing that facilitates a direct connection with the energy of Source or Creator. We become aware of blocks preventing the flow of our daily life. As we release these blocks with the help of our facilitator, we reintegrate ourselves and we heal deeply, our heart opens to unconditional love of ourselves and to others. All Love is an amazing, self empowering healing experience that has its roots in the ancient Egyptian spiritual tradition. All Love is healing with the heart. When you are fully supported in a space of safety and trust to feel your feelings, while being fully present in the here and now, old suppressed and previously unacknowledged feelings will rise to the surface like bubbles, to be expressed and deeply felt, and finally released. As the All Love energy moves around and through you, any feeling that is not in harmony with this love will rise to be released. As you move through this process you find that these old suppressed feelings are portals that open the way to the peace and joy that is who you really are in your core being. What a gift, as you find that you are ultimately in charge of your own healing. All Love energy is not something that is given to you or done to you, but something that is yours to move and transform with. It flows with you as it brings you to wholeness and completion. It is is a totally natural process. It can be experienced very powerfully one on one with a facilitator, and supported by group energy at a workshop. All Love energy takes you to the depth of your being and illuminates everything. It takes you to your most remote interior reaches, and then brings you back to your radiant, beautiful nature, that lies beneath the pain. You can then reclaim your birthright of peace, joy, unity, and true compassion for oneself and others. "All Love is the experience of the one heart that connects us to the 'All' of creation. It is through the divine quickening of All Love that we come to love all aspects of who we are and come into a state of re-union, not just with ourselves but with all of creation." Emotional Freedom Technique dissipates negative emotion by balancing the energy system. All negative emotions result from a disruption in the body’s energy system. EFT heals by removing this disruption by balancing the energy system-neutralizing the power that unhealthy belief systems have on us. This is done by awareness of disharmony and simple tapping on acupressure points which can be quickly learned by anyone. Yuen Method Full Spectrum Wellness, Revolutionary Energy Work. Yuen Method Healing is an amazingly efficient and thorough method of performing an Energetic Diagnosis of Self and Others to pinpoint sources and causes of physical, mental, emotional, psychic, and spiritual symptoms. These root causes are cleared and released, eliminating the symptoms in the process. Polarity Therapy and Cranial Sacral Work: Experience a light touch bodywork that gently, yet significantly restores a balance to your entire energy being. The Ayurvedic Five Element model of energy balancing supports this beautiful restorative and revitalizing bodywork experience. The balance of Earth, Water, Fire, Air, and Ether Element in our energy field and life are explored and restored. This therapy is generally integrated into the fabric of one's session to support a peaceful, relaxing, aligned, and grounded outcome. Any other elements of spiritual healing might be integrated into the session as well, such as crystal, sound, crystal/flower essence, or Theta Healing. Chakra Balancing Sessions - Techniques such as Sound and Vibrational Healing, Guided Imagery, Color and Crystal Therapy, Seed Mantra Chanting, Theta Healing, the Yuen Method, and Emotional Freedom Technique, are used to clear and balance your chakras. Your energy levels are optimized, and your entire being is brought to health and wholeness. These techniques support your body-mind-spirit in reaching its highest potential with grace and ease. Integrated Energy Healing Session or Rainbow Healing Session - An Integrated Energy Healing Session or Rainbow Session may include any combination of vibrational healing and spiritual healing options, such as color therapy, crystal healing, crystal essences, sound therapy, visualization, Reconnective Healing, Theta Healing, or Chinese Integrated Healing. Integrated Energy Healing & Light Realignment - This is a very deep and powerful balancing, aligning, transformational, healing, and spiritually awakening session, combining the Integrated Energy Healing and Light Realignment.This is a profoundly powerful spiritual healing journey. Please read the descriptions of the Integrated Energy Healing, and Light Realignment, on this website. Hypnotherapy allows you to connect with your higher self, beyond the chatter and judgments of your conscious mind. This opens the pathway to positive transformation on all levels--mental emotional, physical, and spiritual-- that you so deeply long for! Past Life Regression, beyond the joy of personal discovery, can help resolve today's life challenges through the release of pain, illness, stress, allergies, fears, or anger. Discovering the past can manifest a clearer "life flow" in the here and now. This healing session is a synergy of two or three sacred healing arts: mandalas, crystal healing, and possibly sound vibrational healing. This session can take many forms. One may create their own crystal mandalas on their body, or on a surface in a sacred space. I will likely create a crystal mandala on my client, as they receive healing, as well as possibly sacred sound vibrations resonating with and supporting the beautiful light of their sacred crystal mandala. Other spiritual healing perspectives may be included as needed, to further support the client's highest good and healing. Clients leave refreshed, renewed, more energized, full of light, love, and peace. An Achievement Consultation Session is a powerful life changing experience. It is a transformational experience where you will overcome obstacles and setbacks, and finally achieve excellence in whatever area you desire. You will learn what your inner resistance to achieving your goal has been, release it, and receive positive suggestions that invite in a strong forward momentum in this direction----establishing positive neuropathways paving the way for the success you desire. This is an amazing transformational process that will help you realize your goals. A Habit Control Consultation Session helps you to transform your difficult habits, and overcome setbacks and obstacles. You can finally be free of those habits that don't serve you, and significantly improve your quality of life. Hypnocoaching brings the mission of coaching to another level. Coaching provides insight, guidance, support and accountable "action steps" for achievement of any particular goal. Hypnocoaching further expands and deepens this process by working on the subconscious level. It is common knowledge that accessing the subconscious allows for deep insight, profound transformation, and positive momentum in your life via positive reinforcing statements that establish positive neuropathways. This work propels you in the unfolding of your journey of manifesting your dreams. Through tools such as meditation and visualization, you connect with your deep inner mind--that "knows" deeply your inner vision, and translates this into your life mission. You ultimately live/embody your life mission via "action steps" you have laid out for yourself. Your hypnocoach guides, supports, and gently holds you accountable so that you are totally, lovingly supported. Positive reinforcing techniques, such as visualizations, are used that anchor your commitments and action steps into your whole being. This guarantees success of reaching your goal, living your dream, of being all that you can be! Hypnocoaching will wonderfully transform both your inner and outer life in a way you may never have thought possible! Guided Imagery is a powerful healing experience that accesses your subconscious mind, using visualization and meditation, for self understanding and insight for whatever it is you are seeking. It also provides wonderful opportunities for cultivating strengths, desired qualities, and seed potentials, as it lays down powerful positive neuropathways for desired transformation. Universal archetypal images and symbols often come forward from the subconscious to bring you to your deepest inner truth, catapaulting you forward in your life's journey of fulfilling your deepest dreams. Sound Vibrational Healing is a powerful tool that can transform and heal, or bring to "wholeness" and balance, our entire being. Intuitive vocal toning, chimes, rattles, drums, ancient Tibetan singing bowls, and tuning forks are possible vibrational tools experienced. Sound Healing Training and Sound Healing Certification Programs are offered as group and private classes. Contact Karuna, if you are interested in these. Voice / Singing Therapy - You can find out who you really are, realize your deepest truth, and fulfill your highest potential, by using your voice. Our voice is a powerful means of accessing the very deepest truest aspects of who we really are, our divine essence. On your vocal healing journey, through our session work together, whatever is out of alignment with this light, is gracefully released. You will learn how to use your voice to promote relaxation, let go of fear and pain, experiencing the voice as both a vehicle for healing and spiritual experience. Our voice has the power to connect our body, inner self, and outer world. It can express words of power, make beautiful music, relax the body, connect us with inner peace, and clarity, as the prefrontal lobe is activated through its natural overtones. It also offers us the amazing potential to let go fear, anger, worries, and pain. We all have the potential to connect with energy that frees us. 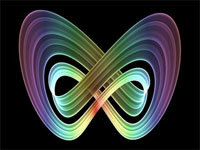 We are vibration and can resonate with infinite fields of possibility. At birth we are pure spiritual beings, of infinite beauty and perfection. Now, through sound vibration with our voice, we can reconnect, reclaim, reactivate, and reawaken to that innate purity, without habitual limitation, and boundaries, into the realm of soaring spiritual freedom. In our sessions, the voice integrated with ancient sound yoga practices, subtle movement of breath, tone, music, consciousness, and energy healing balancing processes, opens the way for joy, wholeness, freedom, and deep peace. Singing / Voice Coaching - As you discover, and open your voice to the divine sound within, you will begin an amazing healing journey, awakening to all of life through singing. Science is beginning to prove what ancient cultures immersed themselves in, the knowing that our voice can be one of the most powerful transformational forces through all levels of our being. In your session work, you will reclaim your vocal healing potential through exercises, steeped in time tested spiritual vocal tradition, and classical vocal technique. Breathwork, light energy healing adjustments, vocal yogic techniques for emotional release, classical vocal perspectives, chanting, and profound spiritual insight, interweave to support your stepping into your true power as a singer, and free flowing integrated human being. The realization that everyone can sing, unfolds in the course of our joyful, loving, graceful journey together in your sessions. Six Healing Sounds Session - Experience, and learn this powerful self healing process that releases stress by balancing and energizing on all levels. This is the Taoist way of dealing with stress. It is simple, easy, yet profoundly transformative, as it transmutes negative energy into positive, loving, healing energy. The Six Healing Sounds transform negative energy stored in the organs into healing light. Once the negative emotional energy is transmuted, it can be circulated through the Microcosmic Orbit to send healing energy throughout the body. This process is a gateway to optimizing all levels of your being, allowing you to move freely forward to be all that you can be! Experience this session, and move into the amazing healing space of the ancient Six Healing Sounds! This session can change your life forever! The Six Healing Sounds is also effectively experienced in a group, and is offered as such at various times. Crystal Healing is the use of crystals to bring about healing and positive changes in one’s spirit, emotion, mind, and body. Gem stones and crystals have amazing healing properties that support needed changes in one’s life. In a Crystal Healing Session, appropriate crystals may be placed on or around the body. I use Crystal Healing in synergy with other healing modalities, although it is highly effective as a standalone session. I find that they all support each other in session, and love to work together! Crystal Journeying takes you to a past or future life, or to meet your Spirit Guides, using the Theta wavestate amplified by crystals. It is incredibly relaxing and energizing, and profoundly transformational. Bach Flower Remedies evolved from Dr. Bach’s belief that the ills of the heart and spirit must be the focus of a healer’s attention. He found a medical connection between feelings and actual physical illness. Dr. Bach developed herbal essences from 38 non poisonous plants. 4-6 remedies are usually in a person’s formula. “Remedies are extremely sophisticated in their action. They are unusually gentle and yet profoundly potent in their effect on balancing out the body’s subtle energy fields. I use them almost exclusively… and get very good results. In many cases they alleviate the problems where all else has failed,” states Herbert Fill, M.D. psychiatrist, former N.Y. commissioner of mental health. Come to balance and realignment, and move back into resonance with your soul's purpose through an application of Sonic Astrology. This transformational healing and balancing may be done with, or without an astrological chart. This is a sonic astrological resonance experience, rather than an astrological chart reading or interpretation. Planetary Tuning Forks that hold the planetary frequencies, and Brain Tuner Tuning Forks that clear and synchronize the brain, creating space, open you up to receive the needed planetary frequencies. Both support your sonic astrological healing journey. Other sound instruments, voice, crystals, visualization, and movement, may all be integrated into your experience, for a cosmic multidimensional realignment. You will emerge from your session radiant, shining, full of light, and yet deeply grounded to Planet Earth. This may be experienced as a group or private session. A Sonic Astrology Journey is definitely out of this world! Shamanism supports our quest for a balanced life, in that it enhances our personal spiritual connection. Science reinforces this by affirming that a strong spiritual connection supports healing on all levels. Shamanism, having been around for over 5000 years, has been cited as the first spiritual practice of humanity. Shamanic practices, based on deep meditation, support our resolving problems and determining potential solutions. The Shamanic Journey is the basic technique one uses to initiate one's personal spiritual connection, and then to access deeper and higher levels of spiritual guidance. The Journey is done by lying down with eyes closed, guided by the drum. You will enter into a deep meditation/ trancelike state, often resulting in somatic and visual imagery, full of archetypal themes, visions, and intuitive knowledge. Journeying enables us to enter healing realms of wisdom, transformation, and empowerment. The Journeyer can meet with personal spirit guardian helpers, known as guardian angels. Our journey can offer deep intuitive and spiritual guidance. This work can lead to significant functional and effective change in ordinary reality and can improve our quality of life. A Shamanic Journey can be experienced individually or in a group to great benefit. If one assembles a group, please contact me to arrange the group Journey, or an amazing solo Journey, whatever is your wish. Join us for these family friendly events, and enjoy the joy, fun, deep connection with others, and peace of group laughter, known as Laughing or Laugha Yoga. We will experience the amazing meditation of laughing for no reason, laughter for its own sake, that takes us to that beautiful place of union, oneness, or non separation, and deep peace, the goal of Yoga and all spiritual practice. Laughter games, childlike playfulness, visualization, laughter, and breathing, open the portal to a new way of freedom, peace, and joy through laughter. Following a period of active spontaneous laughter will be a time of deep relaxation, profound peace, and reunion with our spiritual light, often supported by beautiful healing sacred sound vibrations, of many instruments and voice. Laugha Yoga, Laughing Yoga, or just plain laughing offers many benefits including: mood enhancement, raising self esteem, balancing the brain, increasing creativity, and clarity, oxygenating the blood, releasing endorphins, and producing t-cells which boost immunity. Group and private Laughter Sessions invite the possibility for you to enjoy the many benefits of spontaneous laughter in your life, on all levels. And the wonderful thing about laughter is that it is contagious! How does this feel? World peace through laughter? Check our schedule for upcoming sessions, schedule a private laughter or laughter yoga session, or request a group laughter Yoga or laughter session soon! Yoga Nidra is an ancient, self healing process which deeply purifies the energy body. Such a profound clearing on all levels takes place, that during the final stage of a Yoga Nidra experience, direct co-creation of the next phase of our soul's journey is called in. The purified Yoga Nidra consciousness, where divine love and light are strongly present, is the space where dreams begin to actualize in all aspects of our lives, on all levels. Deep relaxation, peace, harmony, balance, well being in all ways, and bliss, are some of the other blessings of Yoga Nidra. The more we become attuned to the Yoga Nidra journey, through daily repetition, anchored in guided meditation, the easier it is to let go, surrender to the journey, and deeply awaken to that profound state of being, where we can create the amazing next phase of our soul's mission. So, take some nice long slow deep breaths, and let yourself experience the deep Yoga Nidra consciousness. Crystal essences were created using the principles of resonance, homeopathy and vibrational medicine, sunlight, quantum physics, and metaphysics. They are based on the vibrational frequencies of gemstones and crystals, and are preserved in a solution of distilled water and brandy alcohol. Crystal essences can be used safely by anyone, and especially by people who are interested in self healing, healthcare, and spiritual and personal growth. Using these essences inspires healing and transformation in those wishing to make fundamental changes in their lives, resonating with the higher universal spiritual principles of life, love, truth, wisdom, joy, compassion, forgiveness, and peace. Crystal essences address the root causes of conditions and symptoms - the limiting attitudes and belief systems, the psychological and emotional patterns of our past, that generate distress and physical illness in our lives. All kinds of illness and distress arise from these dysfunctional energy patterns, which are not resonant with our search for inner wisdom and truth, and interfere with our harmonious resonance with the world. Through the principles of resonance, crystal essences are used to strengthen our positive qualities, and support us on our healing journey towards physical health and well being, and higher consciousness on all levels. Do you find that over and over again the same things seem to be holding you back from being your highest and best, from moving freely forward on your soul's highest truest journey? Do low self worth, low self confidence, fear of failure, and feelings of being incomplete and "not good enough" plague you over and over again? With several spiritual healing perspectives we can easily clear patterns of self sabotage and negativity that block you from reaching your highest potential. Then we will energetically invite in the loving positive qualities that support your coming to wholeness and perfection in all ways. Your self esteem, self confidence, and sense of personal value, your spiritual connection, your energy level and entire attitude towards life will expand so much that the sky's the limit for the perpetual unfolding of infinite wondrous possibilities for your soul's journey. Transformational and Balancing Sessions are a synergy of several highly effective modalities that support your momentum to come to balance on all levels, resulting in a wonderful healing transformation. This healing is experienced physically, emotionally, mentally, and spiritually, producing a feeling of optimal well being. Any of the previously mentioned modalities might be integrated into a Transformational and Balancing Session. During these sessions, one of my priorities is to teach my clients how to strengthen, align, and clear their energy system, so that they may continue the healing momentum of their session on their own. Following through with their "Homework", clients continue to report consistent success in moving forward with their transformation. One of my greatest joys is to see them empowered by their own self healing gifts. My deepest wish is to support my clients in their journey of self healing, helping them to clear the way for them to be all that they can be, in the highest and best way, with grace and ease. I am always deeply honored, and grateful for our magnificent work together. Karuna can offer email support, primarily, to clients at a reasonable rate. Spiritual Energy Healing is effectively shared via email. People have received healing at all levels, physically, emotionally, mentally and spiritually, via the written word. This is yet another way to experience relief, transformation, and a stronger spiritual connection. Besides guidance, support and inspiration via the written word, many wonderful easily accessible self healing processes are shared with my email clients. Using these resources, a client can directly engage in their own self healing, along with Karuna's consistent email guidance, support, and inspiration. With this healing option, clients have unlimited email exchange with Karuna on a monthly basis. This is a convenient, economical, and highly effective healing service that many have enjoyed. I love working with children of all ages! They are happily responsive to this healing, so ready and able to quickly return to their natural state of balance and ease. Children with anxiety, unrest, insecurity, anger, fear, often with accompanying physical symptoms, so easily let go of what no longer serves them, and come to a state of inner peace. The physical manifestations of their emotional/mental symptoms fade away like clouds on a windswept day. What an honor and delight to share spiritual healing with children! Magic is gloriously alive for them, as they gracefully open themselves to the wonder, love and joy of their miraculous healing journey! Finally, Reiki Classes for kids 7 and over, and their parents! These classes include two attunements to open your energy field to channel universal energy. You will both learn about Reiki, how it heals, and how to use it for your self healing, and the healing of others. Certificate and manuals are included. Classes are available on request. These classes will be available for 3 levels of Reiki! This Theta Healing class is officially called the Rainbow Children's Class and is designed for the Child in us all, as well as for actual "Children". Adults and other "Children of all ages" are welcome to join this class, growing their intuitive abilities, and strengthening their connection to Spirit (whatever that is for you- God, Allah, Buddha, Jesus, Great Spirit, or just Universal Energy). There are 16 lessons. When taken in sequence, you will experience your intuition heightening, your spiritual connection deepening, and your healing abilities blossoming. It is also possible to take any of them separately, or out of sequence. However, your final outcome might not be as dramatic or profound, although each class can stand on its own and still offer great benefit. Another positive outcome of taking all the classes in sequence is that you would receive the bound manual, and receive a certification as a Rainbow Children Practitioner under the guidelines set by the Theta Healing Institute of Knowledge. You would then be certified to use any of these processes with clients, having demonstrated proficiency with the processes. Rainbow Children are sensitive and highly intuitive children. This child is born with infinite wisdom, and the ability to change the world around them. A Rainbow Child is different from an Indigo Child. An Indigo Child ushers in a new age. Even though an Indigo Child has strong intuition and manifesting abilities, an Indigo Child is influenced by negativity around them. A Rainbow Child is adaptable, and can shift the energy around them to reach the highest needs of all beings. This child has a high moral sense, and knows energetically how to transform the energy. Indigo Children are now shifting into Rainbow Children. With practice using their intuition, adults can shift into Rainbow Children as well. They are loving adaptable people with ancient memories, memories of their skills, and infinite love and patience. We welcome their special, able energies. Many Rainbow Children will experience this class. This class helps all to realize the Rainbow Child that is within us. Everyone learns how to open up their intuition, and connect deeply with Spirit, opening the way for us to fulfill our highest potential and be all that we can be. Each class takes two hours, and if in the certification class, should be taken at least once/month, and ideally more often than that. It is ideal that the following separate groups form, (although exceptions can be made for families): 7-11 year olds (or younger, if good attention span), 12-23 year olds, and all adults. Children may come with or without parents, whatever is comfortable. Parents are encouraged to come as a participant, and enter thoroughly into the spirit of class, supporting their children, themselves, and others in the class. At least four participants are needed per class, though exceptions can be made. This is a fun, amazing, consciousness raising opportunity. Don't miss it! The schedule will take form as needs arise, so please contact me soon, if interested, and classes will materialize. Day One – Empathic Reading of an Object: Learn the difference between your feelings and another’s. Day Two – Guided Meditation: Understand visualization and meditation that manifests healing. Day Three – Readings and Body Scans: Understand how the energy of Creation exists everywhere, and learn how to do readings or body scans. Day Four – Instant Healings: Learn the Theta Technique, of connecting to Universal Spirit, and effecting instant healings. Day Five – Releasing Limiting Beliefs and Feeling Work: Learn the Theta Technique for releasing limiting beliefs, and bringing in feelings needed for healing and wholeness. Day Six – Guardian Angel Readings: Learn how to discern guidance from spiritual beings and guidance from the Divine Spirit. Day Seven – Clairvoyance and Seeing Aura: Learn to see with the third eye as you develop clairvoyance. Day Eight – Crystals and Healing Stones: Learn to connect with crystals, ultimately cultivating honor and respect for Mother Earth. Day Nine – Crystal Scrying: Learn this fun and captivating exercise that shows you the magic of crystals with crystal scrying. Day Ten – Plant Readings and Healings: Learn how to deeply honor and deeply communicate with a plant, and how there is an herb for every illness. Day Eleven – Healing Animals and People: Learn how to communicate with and heal animals and people. Day Twelve – Find Your Power Animal: Go on a traditional Native American Journey to find your Power Animal, who is there to guide and support you for the rest of your life. Day Thirteen – Contact Spirit Guides through Crystal Layouts: Experience a Crystal Layout, learning our interconnectedness with crystals, as we go on a journey to experience our spirit guides. Day Fourteen – Moving Objects with Your Mind and Remember Your Future: Experience the Laws of the Universe, and experience Telekinesis, as we realize we are a part of all that is, the object and can move. Day Fifteen – Sending Love to the Baby in the Womb and Healing the Broken Soul and Broken Heart Exercises: Learn some profoundly powerful healing exercises of heart and soul. Day Sixteen – Manifestation Meditation: Learn the “You are a part of All That Is” meditation to manifest powerfully. Meditation is a state of thoughtless awareness. Rather than an act of doing, it is a state of true awareness. One can engage in one’s daily activities in a state of true meditation, whereas one might be in a meditative posture, and yet far from a meditative state of mind. True meditation is a state of deep, profound peace, experienced when the mind is calm and silent, yet totally alert and aware. This is where an inner transformation takes us to a higher level of awareness, where we can fulfill our highest potential as human beings. Meditation can be an effective form of stress reduction that can improve your quality of life and decrease healthcare costs. In this thoughtless awareness, the mind is quiet, yet aware, alive, and alert. I offer guidance and support for a fulfilling meditative practice that will enhance your life in all ways. A variety of meditative styles from many traditions might be explored to match one’s particular temperament at any particular time. Anyone can learn to immerse themselves in the wholeness, peace, and joy of deep meditation, and in so doing realize their deepest truest self. I am delighted and deeply honored to be able to guide you on this life changing journey. Spiritual guidance, counsel, and inspiration are offered, supporting an opening of your heart, spirit, and mind, on your journey of awakened, self understanding, and enlightenment. Through loving guidance, meditation, guided visualization, and deep spiritual connection, your inner spirit is birthed, and your inner light, wisdom, and compassion begin to radiate out from you, illuminating the entire universe. As your spiritual midwife, sacred space is held for your light to once more be born into awareness. As spirit within, is again born, our inner spirit invites its radiant light to open up, and shine out through all that is, through all time and space. Meditation, visualization, and many spiritual healing practices, such as sound vibration, and particularly All Love group and individual experiences, support the birth of our expanded spiritual awareness, and compassionate lightfilled loving heart. Have you ever noticed how certain places, homes, and offices make you feel really good, relaxed, light, and happy, while others make you feel uneasy, sad, or just burdened or heavy? Land, objects, buildings, and homes can hold memories, emotions and feelings. They hold energetic imprints of everything that has happened around them, and in them. They actually take on a certain "feeling" or "individual consciousness" of their own because of these imprints. Difficult energies left behind may be due to stormy relationships, where chronic conflict, stress, frustration, anguish, and depression, filled the space. This heavy negative energetic residue can leave you feeling uncomfortable, uneasy, stressed and drained for no apparent reason. If uncleared, this negativity takes quite awhile to dissipate on its own, adversely affecting the current residents. Space clearing is much like house cleaning, except on an energetic level. Any difficult energies from the home are released with space clearing, and light, peaceful, joyous feelings are energetically introduced into the space with grace and love. There are many benefits of clearing negative vibrations and energies from your home or office. Every aspect of one's being is enhanced - mental, emotional, spiritual, and physical. Relationships and communication improve, with a noticeable reduction in feelings of struggle and anxiety. An increase in feelings of peace, joy, well being, comfort, and increased energy and vitality are among the welcome benefits of energetic space clearing. I am available to provide home and office clearing services. The clearing can be done in person and remotely. I have a number of space clearing tools that I might call upon, including sound vibrations (drums, rattles, chimes, Tibetan and Quartz bowls, and voice), combined with spiritual energy healing to clear negative energetic imprints. I invite in positive energies, blessings, and feelings, such as peace, joy, love, and comfort. My clients are encouraged to participate in the process with me, to the extent that they wish to, empowering them with the ability to do their own space clearing in the future. Feel free to email or call Karuna for more information, or to schedule a healing session or class. Healing sessions for your pets are also available. Pat loves to work with animals. Now you can pay for Karuna's Services online. 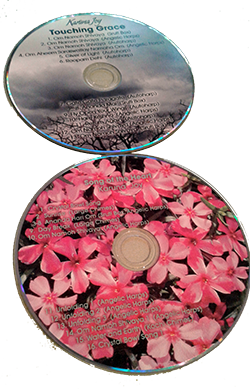 Marilyn Gordon and Life Transformation Associates offer a wide range of life transformation, spiritual growth and healing products and programs. Click Here for more detail. "I would like to thank you, karuna, for the wonderful Transformational & Balancing Sessions you offered me, as one of your healing modality services. After the sessions, I feel more grounded, relieved and more focused on what really matters in my life. I highly recommend Karuna's healing services to anyone feeling burned out or overly stressed." "Karuna, I can not thank you enough for the Transformational Balancing Sessions and the basic DNA class. You are a wonderful healer, teacher, mentor, and very sweet and generous person. I love that during our sessions and classes you teach us how to strengthen, align, and clear our energy system, you always took the time to explain and teach us the new techniques that we can apply in our own healing process. I feel so much better! I have been doing the exercises and saying the Light prayer. It's working! The results of our first session make me feel confidence about your abilities and your powerful work. Karuna is wonderful! I highly recommend her. " "The reconnection was amazing and life altering. I feel a sense of deep peace and joy following the second session. The experience was beyond transformative. I feel renewed in body, mind and spirit. I appreciate you so much ! I am so grateful to have found you on the internet and I look forward to seeing you again soon. You are a gifted healer and a wonderful person; I have enjoyed your stories as well as the sessions at your home." "Hi Karuna, I really missed you! Started feeling more peace, security and freedom, after I went to meet with you... my food issue is getting over with me, and that something that had me very uncomfortable with my self... I hope to see you soon." "Thank you for checking in with me after my Reconnection. Some interesting things have been happening. First, I am still feeling very peaceful and grounded. Second, I find it very easy to release negative thoughts and feelings now and I have been getting messages and lessons of faith (letting go and letting God have control of my life) and actually feeling faith and a general sense of well being much deeper than ever before." "I am doing really well, feeling very centered, energized and peaceful. The clearing was amazing. I can't thank you enough for your teaching, guidance and healing." "Thank you so much for the phone healing. I feel so much better and I really think the main ingredient is the love and compassion you shared with me. I definitely felt better, and felt a release and felt more creativity flowing through me. I want to paint! I know I can continue to feel better by following these self healing practices. It has brought me much joy that you can guide me on my journey." "Thank you so so much for everything. I feel great. The blockage is gone and I feel free. Thank you thank you." "I hope you know how much I appreciate all of your healing. We both enjoy your company very much. You are an exceptional healer and teacher. Much love from us! Hope to connect soon!" "I just wanted to let you know how relieved and grateful I am that all this uncomfortable constant third eye pressure that I've had for the last 20 years, is finally breaking up and dispersing after our session. This is almost hard to believe, but it's true! I am also doing all the self healing exercises you suggested I do, which I know are also supporting my releasing and balancing of the blocked energy in this area. Thank you so much for facilitating this process for me! I look forward to another session, which holds great promise for continuing more necessary balancing and healing of this problem area, as well as my entire being." "Thank you! It was great to meet and work with you too. I am definitely feeling better then when I came into your home. When I got to your house, my light was completely out. Now there’s a glow… I just have to turn up the dimmer ;) I fully intend to keep up the work and come in for another session or class in the future. "I am still feeling very calm- my body has finally released the fight or flight stance......I can't tell you how grateful I am..."
"Thanks again for the amazing private session, you are an incredible teacher and guide!" "Just wanted to let you know I enjoyed meeting with you. I feel so much better! I have been doing the exercises and saying the Light prayer. It's working! I have been eating more, also. But on the next morning, I just hopped in my car and drove to Tyson's for my doctor's appointment with no qualms! Will continue to keep in touch with you." "Thank you so much for your healing, guidance and connected presence this past week. You couldn't have come into my life at a more perfect moment, I feel lifted and connected to my divine Self!" "I wanted to thank you again for seeing my mom. My mom is doing a lot better ever since she saw you. She has her crystal with her at all times. She felt strong and healthy enough to go back home. "It's so amazing to feel light and happy today. I feel like myself again, but maybe better. Thank you for such an amazing transformative healing." "I just wanted to send you a note to thank you so much for the TAT healing. That is truly amazing. It seems miraculous that I did it and the feelings I had been experiencing in the pits of my stomach (fear) have stopped. I'm feeling much better and my energy is much stronger. All of my needs are being addressed and I'm extremely grateful. Thanks for all that you've shared so far. You are truly a blessing. I look forward to meeting with you in person, speaking to you again, and really learning more from you. You are an excellent teacher and healer." "I want to let you know everything is really improving at home - my husband is nice and I try to be nice with him. I still sometimes get upset when kids don’t listen, or I’m too tired, but I’m able to smooth it out. Thanks." "In looking for the opportunity to help heal and review past lives, I found Pat's website. Her face shows so much love and care on her website, so I contacted her immediately and set up an appointment. Having already had some experience with Past Life regressions, Pat provided a unique and deep way for me to access my past lives. Pat created a Crystal Journey. She encircled me with several crystals and played various instruments and kept herself connected with the session, as I journeyed into several lives and healed them independently or as best as I could at the time. Her usage of sound was greatly helpful as I use sounds or music during my meditations and her work helped me reach a depth that I could not have achieved otherwise and discovered more than six lives. When we finished, we reviewed my experiences and she both recorded and typed them up for me to receive within a few days. Pat has so many talents and her presence is so pleasant that I would return to her for either treatments or training sessions that she provides. It is really wonderful to find a healer that keeps to the beauty of her trade!" "I had an amazing time yesterday and I see why you enjoy this work so much. You are very good at what you do and I am grateful for all that you did for me yesterday!" "Thank you for the beautiful session, I'm feeling great today. I had a lot of lucid dreaming last night and these dreams involved many spirit guides helping to do additional clearing and work. I felt a lot of energy moving through my heart chakra and through my feet during our session and throughout my sleep. This is a good sign, as I feel this is good energy flow that I need. I definitely feel the dreaming and energy movement are signs that our session is continuing to do work within me and will continue on. Hopefully we can do another session soon. I'd really enjoy focusing on the sound tools you have, now that we've done our initial session. I really loved the sounds and your beautiful song...thank you!" "Thank you. It was great. We are both already getting a lot of healing. My mom is in the best mood she has been in for quite awhile, and my stress is way down. We have had some remarkable changes and epiphanies, since seeing you. My mom is like a new woman. I really appreciate your help!" "Pat is a true healer. I did the Reconnection with her and had a deep spiritual experience. I felt the presence of something greater and a true healing energy come over me. I saw and heard insightful information during the session. I felt a shift in my life after the process. I think this experience is different for everyone but for me it was very moving. I look forward to trying other healing modalities with Pat." 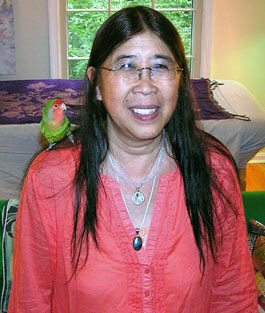 "Pat Chen is a gentle soul who also happens to be an amazing healer, teacher and mentor. She has introduced me to some wonderful healing modalities that are very effective and beneficial. Her healing gets to the root causes of our issues. That's where the true healing takes place." "Thank you for the wonderful sound healing class on Sunday, Pat. I could not believe the difference in how I felt between the time I arrived and when I left. Very powerful! Nice to meet other like minded souls as well." "I want to thank you so much for the sound healing class. It was amazing. I now am thinking about ways to incorporate sound into my life." Thank you for bringing your awesome selves to our healing vortex this weekend! We have started the stirrings of healing within and are carrying them out to the world! ....... I feel blessed to have met you and I look forward to hearing about your breakthroughs!" "I definitely feel on top of the world this morning! this week has been so exciting and new! This weekend really was special and everything feels very refreshed everywhere I turn! I think I will continue to bask in the glow of this weekend for the rest of my life, I'm so very excited!" "my thanks to each and every one of you! What an amazing group! Thanks to you my path is wide open and I am in the middle of it! Wow what a difference all of you have made! THANK YOU THANK YOU! "I am sooo grateful to you for allowing me to take your class! It was so amazing! And life changing..still waiting to be 18 again! Ha Ha!" This weekend was beautiful! I am so grateful to have shared this experience with all the ladies in our group. You are a kind and joyful teacher!" "I really enjoyed spending the weekend with you (and Mary) and getting to know both of you. You truly are a joy to be around. You definitely resonate serenity and love. You will be happy to know that I completed the Activation of Youth and Vitality Chromosome for my husband tonight. I am amazed at how easy it is. Thank you for sharing all your knowledge!" Thank you! I am so grateful of the opportunity you gave us, to meet each other, learn and work together with your amazing teachings! So many lessons learned! I hope we continue to grow in this path of new beginnings. It was an extraordinary experience that I will cherish in my heart for ever! "My daughter and I had a wonderful time in your class. When I asked her if she wanted to take the class again she became very excited. Thank you so much for offering these classes. I love that we can can come, learn, bond, and leave feeling more spiritually fulfilled." "I have to tell you, after we spoke through email yesterday I felt amazing sensations all day!! I had to lay down for a while because they were so overwhelming yet wonderful!! It was almost as if I had too much to drink (haha!). Does that make sense? Your energy and light must be fantastic! I can't thank you enough for all of your help, time, and energy. I feel better already and it was only a short time ago that I contacted you. What you do is admirable and I hope one day I can do the same for others. Thanks again for everything and I can't wait to actually meet you in person! You are such a blessing! Enjoy your day!" "Thank you! I immediately felt a difference and today was productive and pain free!! Can't thank you enough and super excited about my session next month!" "Every email you send me lifts me up, empowers me and makes me feel like everything is going to be okay...better than okay. I appreciate all your time and wisdom! Thank you Karuna. " "Thank you for a marvelous healing session. That evening what I most noticed was being more present in my body and connected to my emotions.... I observed that I was moving into action to address the issues with my son.... and feel more optimistic about being able to become a better communicator with him. I spent a couple of days in my office completing things that had been sitting on my desk – what a relief! Something has shifted! I am most of the way through Eric Pearl's book. I'd like to find a time to experience The Reconnection with you. Please let me know your availability. "I was very fortunate to have experienced both the Reconnection, and a Reconnective Healing Session, with Pat. My Reconnection process was not what I was expecting, but a tremendous relief. I felt as if something heavy was lifting off my chest the entire time. I felt more free. I could both feel and hear the 'lightening' process! During my Reconnective Healing Session, I felt as if everything that was bothering me flowed out of me like a river.....total relaxation and peace." "Pat is a wonderful healer, she has helped me a lot with my personal situation, talking to her gives me peace and teaches me to control myself with the anger that I feel when negative thoughts come to my mind, and when I feel very disappointed and sad. She is a very sweet lady and has a lot of patience to answer my questions and listen to me, helping to understand myself. Her "Theta healing meditation" is wonderful; it gives me peace and helps me to relax. She has taught me many other techniques to work with my energy and my sons' as well. Those other techniques are magnificent, I really enjoy very much practicing them. Thank you very much Pat for those gifts you give me every time we talk." Yesterday, I got the idea that I should ask my mom if she would like to do three healing sessions over the weekend. She said that would be a good idea. We did a little discussion first about what would happen and then I set her up and started. She had a lot of the registers (head turing, eyes fluttering, leg movements, breathing changes and stomach gurgling). I also had some registers, the palms of my hands got really hot and there was actually a breeze that came up in the room. I also had some guidance--for example, it was like someone was telling me, "work your way down to her right foot" and I would and then my palms would get super hot and her foot would start moving. I had some background music playing and the guidance said, "after this song you are done for today" and it was funny because even though I continued through the song, the registers stopped. This one went a lot better than the first time I tried (last weekend). I think it was because I got myself out of the way finally and just let it flow (the last time even though I tried I had this intention that she needed certain things healed). She really liked it and we are going to do another session today. I did the third session today and I got this idea to have my mom form an intent to be healed (I had not said anything like this to her before because it seemed like you are supposed to stay neutral--but today, I just really had this strong urge to tell her to form the intent to be healed). What followed was really amazing--there was a fairly steady breeze in the room (no open doors or windows and the ac wasn't running) and at about what ended up being the halfway point, I started moving my hands so fast it was like we they were hummingbirds and my mom was twitching and her legs were jerking and she sounded like she was sound asleep as far as breathing--but she wasn't. Then I sort of slowed down--but I was still doing the movements and she opened her eyes and said "ok, we're done." I haven't seen any big changes yet--but I imagine that some big healing is coming. "I have been wanting to thank you so very much for our time together last week. I am so at peace now. I still have bits of the wall to break down but it is not nearly as overwhelming as it was before we met with you. I have been clinging to my moon rock and rose quartz, wearing the bracelet every day. I've been working on centering myself and breathing past that wall. I am really feeling better about everything. I cannot thank you enough." "I want to thank you for the wonderful session on Saturday. I am feeling better than I have in a long time. Your gifts are a blessing to me, your gentle presence, the time you took with me, the healing and the physical gifts of rose quartz and the book, and the 'getting to neutral', affirmation exercise and energetic strength and alignment. I have a wonderful sense of peace and joy today. I walked 10 laps at the track yesterday. Usually I would 'talk myself out of it' like "I can't do that many laps" I have new insights and renewed energy. It's wonderful! I look forward to hearing from you about scheduling. Peace, love, and joy to you!" "Pat Chen is an amazing healer. She went over and beyond to truly understand what I was hoping to accomplish, and select the appropriate method based on my needs. After my first Theta session with Pat, my mind was much sounder, and emotionally, a large amount of baggage had been released. Not only did the results manifest emotionally, but they also manifested physically- I actually lost weight. The next morning, my clothes were looser, and I felt taller. Spatially, the world seemed different, and I began to see things differently- in a good way. I will continue working with Pat, as I believe that she is a thoughtful and talented practitioner." "Pat is an inspired, compassionate healer. She practices many profound and helpful techniques, and she has a heart of kindness. She has a gift for what she does."